I currently use Google Chrome browser because it has an extension to block ads. Now, I know that the Internet is ad paid for and I don't mind seeing ads on pages. What I hate are animations on the pages. Ads and banners everywhere moving. Google Chrome browser has an extension to stop Flash, but it doesn't stop a lot of animations. Is there a way to block all animations on the screen and still see the ads that pay for the internet? In this excerpt from Answercast #75, I look at the problem of websites with so many animated advertisements that it's annoying. Unfortunately, no. The problem is that there are so many different ways of doing animation for a web ad. Flash is perhaps the most common, and certainly by blocking Flash, you'll have blocked a lot of them. But there are so many other ways that the animation can be done. There's simply no way to block all of them and no way to block the simpler or more common ones. For example, there are ads that are nothing more than images. They are much like a picture you might take - except that some image file format (most notably the .gif format) allows for a limited amount of animation. Many advertisers use this specific format because to the browser, it's nothing more than a picture. To the browser, it's nothing more than as if you had put another image (a jpeg or some other image) in that web page. Unfortunately, that particular image has some animation to it. Next from Answercast 75 - Will it cause a problem if I choose a different name for my backup than that recommended by Macrium Reflect? How do those ads know where I live? Spooky, isn't it? I see the same thing when I visit certain websites. There are a couple of ways this can happen. I am currently using AdBlock Plus extension with both FireFox and Chrome and I am satisfied with it. I agree with Ashkan, Adblock Plus for Firefox works GREAT! I hate to hurt great sites like Leo's, but too many sites are doing flashing, blinking, moving ads. You can disable Adblock on a per-site basis though, so throw a bone to a site you like that doesn't do the annoying ads. I used to use Adblock, but have learned to just ignore ads for the most part. If ads on a site are really too much, I just don't go to that site anymore. As far as Ask-Leo is concerned, I don't really have a problem, and sometimes, though infrequently, I do click through. I believe the increase in ad blocking is because websites are allowing more annoying advertising. 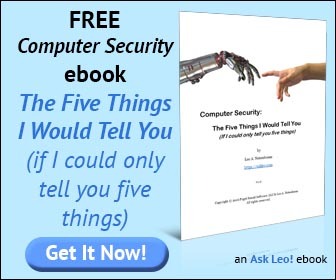 Banner ads and the odd static ad placed throughout an article, such as on Ask-Leo, are perfectly fine. But when websites start allowing flashing ads or giant ads down the margins of the website, or even worse, ads that keeping bouncing in at the top or bottom of the page as you scroll through the page, those things get annoying. It's no wonder people want to block ads. Advertising revenue is based on the number of eyes looking at the ad. Every time a browser displays the ad, the counter goes up and so does the revenue for the hosting web site. An ad blocker prevents the browser from requesting the ad get loaded. Therefore, there is no count and no revenue. Free websites like Ask-Leo! rely on advertising revenue to keep the site free, so if you block ads on Leo's website/newsletter, you could be potentially taking away revenue from Leo. If enough people do this, Leo would have to decide to either switch to a paid subscription or abandon the newsletter altogether. 1. Use ctrl+p to make a pdf print of the page, just for reading; all the animation is gone, and you often have a bigger font, for easier reading. 2. Start IrfanView (a freeware picture viewer) without any picture in it, select the option "always on top", size the empty (black) window to cover the ad region, and read the page without any distraction. Sometimes you may have to turn off the sound as well. Thought Eric did a very good post. In lieu of this and other things I have read here and elsewhere I have decided to allow adds on sites that I view as valuable to myself and others (You definitely included). But I will continue to block sites that overdo the whole scenario. Some of them are ridiculous ! Thank you Leo for explaining. I did not realise that blocking the ad was detected by the advertiser. However, Kevin has suggested an excellent idea. I can now see that it is very simple to create an "Allow list" in my ad blocker, so I could easily put Leo's URL in there. If I upgrade to a faster broadband connection with a bigger monthly allowance then it would not slow down my browsing too much and I would still not exceed my allowance. I could then also click on a few of the ads to open in a new tab. New tabs download without interfering with the open tab so I won’t actually see the advertisers web page, but Leo would still get paid. Sounds like a win win situation. I found some hardware that works very effectively. It's called a strip of cardboard, and can easily be found free. I just lean it against the monitor covering the annoying ad. Easy to install/uninstall - no learning curve. Easy to store under the mouse pad or keyboard.